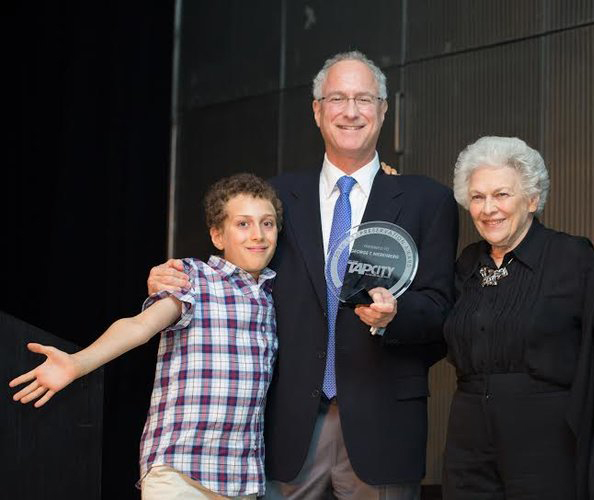 George T. Nierenberg receiving the American Tap Dance Foundation Tap Preservation Award in 2014 for the superior advancement of tap dance through presentation and preservation. (George's son Jack, George, George's mother Juliet. In No Maps on My Taps, documentary filmmaker George Nierenberg captures the brilliance and the passion of tap dancing giants Bunny Briggs, Chuck Green, and “Sandman” Sims, along with Lionel Hampton and John Bubbles. Nierenberg’s follow-up film, About Tap, is introduced by Gregory Hines, and features performances by tap dancing greats Steve Condos, Jimmy Slyde, and Chuck Green. No Maps on My Taps and About Tap not only rejuvenated the hoofers’ careers but also revitalized tap in the U.S., from where it spread around the world. Both films are currently available on DVD-R from Milestone Films, who will be restoring the films and adding bonus features. New DVDs will be out next year. Availability: On DVD-R from Milestone Films. • Thanks to Tony Waag, American Tap Dance Foundation, and Lynn Schwab for making this interview possible. George Nierenberg with Chuck Green, Bunny Briggs, and Sandman Sims on the set of No Maps on My Taps. Photo courtesy American Tap Dance Foundation. DT: In your film About Tap, Gregory Hines spoke about personal style. You spent a lot of time with Chuck Green, Jimmy Slyde, Steve Condos, Sandman Sims, Bunny Briggs. What did you learn from them about the importance of personal style in tap? GN: I can talk about it in terms of tap dancing if you like, but I see it in terms of a bigger sense of what it means to be your own artist. I came to understand that what they do and what they’ve brought to their art is demonstrative of any person who tries to find themselves and tries to express themselves individually as to who they are. You can see their personality in their art. You can’t separate one from the other. You can’t have Chuck Green doing Bunny Briggs. You can’t have Bunny Briggs doing Chuck Green—it doesn’t jive. What Sandman talks about in the film is very philosophical in the sense that he uses himself as an example of how he came to understand that you can’t duplicate anybody and still be your own artist. You have to find it yourself in yourself, and that’s what makes somebody unique and special. There are plenty of imitators out there, but there are only a few who are real individuals. In art. In anything. In life. I felt that I told that story to a certain extent in No Maps on My Taps. It was a very engaging story. People understood the humanity of the art itself and gravitated to that, so it was a very popular film that really galvanized the tap community; it was sort of the genesis of the resurgence of tap. A lot happened afterwards: There were tap parades, and we did a tour around the world, where the film was the first part of the show. Then the tap dancers would come out, and they’d get a standing ovation just for walking on stage. We did over sixty shows around the world, called No Maps for My Taps and Company. The dancers had never experienced anything like that. Normally they’d get on stage and have to work the crowd. But on our tour, the crowd was in the palm of their hands when they walked out on stage because the film made them bigger than life. When I met them, Bunny lived in a small apartment with a woman who was not very nice to him. Chuck Green—all of them—didn’t have any prominence. Tap dancing was dying, from their point of view. The film opened at the Telluride Film Festival. We brought Sandman Sims; he became a big celebrity, they did Broadway, they were in a feature with Gregory. Their careers took off. Not only that, a whole generation of tap dancers learned from them. It became so much more popular, in a bigger sense, around the world, but they became the masters. They became the ones who were really respected old men. They got what they deserved—they were valued in a way that they never could have anticipated. I made About Tap because I felt I hadn’t really paid tribute to the art of tap in No Maps for My Taps. I was very, very careful about who I selected for both films. I could have picked any tap dancer—it could have been Honi Coles, it could have been Buster Brown, Lon Chaney. I wanted Jimmy Slyde to be in No Maps for My Taps, but he was in Europe. For About Tap, I chose Steve Condos, Jimmy Slyde, and Chuck Green because I felt that collectively they could tell the story. I picked Chuck Green again because I felt he was such a galvanizing force for the dancers. He was institutionalized for many years, and when he came out, he brought them all together because they respected him so much, so I felt it was important to have him in the film. I wanted to capture Jimmy Slyde because I hadn’t in the earlier film, and I wanted to capture Steve Condos because his style was so unique, and they were all so distinctively different. I picked those three because I felt collectively they would show a spectrum of the dance that was so unique. I also felt they could articulate what they did above and beyond the dance itself, that their way of expressing what they did was bigger than the dance. They put it in a context where you could view it differently, so what they said enabled you to see inside of who they were and what they were doing. DT: Let’s go back to the issue of personality. You got to know them pretty well over the course of filming. This may be a tricky question to answer, but can you articulate what it was about their personalities that came out in their dance? GN: Bunny Briggs would do a little pose where he put his hands out with his fingernails out front. He said to me, “You know why I do that? Because I get my fingernails manicured, and I want people to know I take care of myself.” It’s a perfect thing. No other dancer would say that, but Bunny would. Sandman has his sand dance. (Click here to watch.) It’s this whole identity. He said Bill Robinson was the one who told him he needed that to be able to make a living. He’s able to make those moves, and he came up with the whole thing himself after trying a lot of things. He lived in California, where there’s a lot of sand, and it was a perfect mechanism for him. He created the board. He’s like a musician with their instrument; his board was his instrument. Pouring in the sand, putting in the microphone, that was his instrument. He had to make the whole thing. GN: He did a sand dance, but Sandman perfected it in the way that he created a board you could stick a mic in, which had a certain kind of surface. He used a precise amount of sand. Bill Robinson tapped up and down stairs. That was his thing, with Shirley Temple. It’s not like nobody had done a sand dance at all, but Sandman had the name Sandman, you know what I mean? He’d come up on the stage with that board and dance in one little spot. Steve Condos would dance in one spot, too. DT: Let’s talk about Steve Condos. What was he like? GN: Intense. He was so committed to his dance. With all of these people, once a tap dancer always a tap dancer. My mother was a tap dance star when she was a child. The height of her career is when she tap danced for the inmates at Sing Sing. DT: How old was she? GN: Ten. She’s ninety-one years old now, and she can still tap dace. She wanted Tony [Tony Waag, cofounder of American Tap Dance Foundation, along with Brenda Bufalino and Honi Coles] to put together a group of elderly ladies who could tap dance on chairs. So once a tap dancer always a tap dancer. It’s part of your being. As far as personality is concerned, Chuck Green is very interesting at the end of About Tap. He has his hat, and he walks off in a certain style in the way that only he could. He had this class. He was the only one who could do that. He had this incredibly unique face, which had such sweetness in it, but at the same time he had the capacity to be so angry like he was at Sandman in No Maps for My Taps. DT: How competitive did challenge dancing get? GN: Remember, Chuck went in and out of …functionality, let’s say. On the day of the performance [in No Maps on My Taps], we couldn’t find him. He had disappeared. I had a lot of money riding on that day. Lionel Hampton, his band, the crew, the place, and everything else. Chuck literally could not be found. He hadn’t shown up at the home the night before. Nobody knew where he was, and now it’s three o’clock in the afternoon and we still haven’t found him. DT: When was the show supposed to go on? GN: Five o’clock. Finally he calls the office and they say to him, “Chuck, where are you?” He said, “I’m in a phone booth.” They said, “Look out the phone booth. Where you at?” He said, “I’m at the corner of Walk and Don’t Walk.” Anyway, they found him and brought him up, so when he got there, he was in a certain state of mind that was a bit raw. Sandman could always get under his skin easily, but Sandman also respected him so much, as he expressed so beautifully in No Maps. Sandman was trying to egg him on, it’s just that Chuck was not in a state of mind that he could really take it. You could see at the end of the performance, when Chuck is doubting himself about how well he did, and Bunny is saying, “No, you did good, Chuck.” At the end, they’re wiping off Chuck’s brow and he says, “Got no maps on my taps,” which basically means I can tap dance anywhere. There are no boundaries to my dancing. So that’s Chuck. He’s poetry. DT: You also directed the films Say Amen, Somebody [about gospel music] and That Rhythm, Those Blues [about the evolution of rhythm and blues]. Is there any crossover with your tap films? GN: Yes. There’s a tie between all the films. That Rhythm, Those Blues was about the evolution of rhythm and blues to rock and roll. In No Maps on My Taps, Sandman is standing in front of the Apollo Theater, and he claims that what took tap out was rock and roll. Chuck refers to the same thing in his conversation with John Bubbles. This is what happened: Rhythm and blues came out of the South, out of the gospel churches. That’s where the record companies would find talent—Aretha Franklin, Ruth Brown. All those people who started out all sang in church, so the record companies would go through the South, get their raw talent, and develop it. They would tour a lot through the South—the North as well—and there were black DJs who were often more famous than the talent. The whites started listening to their music and started liking it, cause they were listening to Pat Boone, but then they’d listen to black music and they could swing to it. The blacks would have these big shows where blacks would go and hear the various groups. Suddenly the whites would start sneaking up in the balcony and watching the blacks, and they’d see things they’d never seen before. Eventually they’d go to the dance floor and try to dance with the blacks, and it created a whole ruckus. The police had to come in, and they’d put up a rope; the blacks would dance on one side, and the whites would dance on the other. Eventually what happened is the whites started copying the black music. Pat Boone would copy Fats Domino singing the same thing. At the Apollo Theater, they started having black acts and white acts together. Ultimately the white acts basically took the black music. They stole it from the blacks, starting with Elvis Presley. He took his music from black churches. “Ain’t Nothing But a Hound Dog” had been sung before; it wasn’t his, but it took over the theater. All of a sudden, that became the popular thing, compared to the variety shows where you had a tap dancer, a comedian, a big band. Lionel Hampton had a tap dancer, Duke Ellington had a dancer. DT: Like The Ed Sullivan Show. GN: Yeah. So the tap dancers lost their work. There was no place for them to dance. They couldn’t be booked. Bunny Briggs couldn’t find work. None of them could find work. So basically it was rock and roll that took over for tap dancers. It was gospel, it was rhythm and blues, and it all ties together cause the tap dancers are connected in that evolution. DT: Making a film is a huge investment of time and energy. What drew you to make these films? GN: The passion of the people. It was just infectious. And I felt I had the ability to articulate their story. I spent a lot of time with them before I started filming, so I really understood the story that I wanted to tell. I felt that if I could re-create that story for someone who didn’t know the dancers so that they had the same feelings that I had, I’d be succesful. My attempt was to engage an audience with the same emotional feelings that I had with these individuals. DT: Can you talk about the relationship between the dancer and the musicians? GN: Jimmy Slyde talks about that a lot in About Tap. There are a lot of dancers, like Gregory Hines and Savion Glover, who like to dance without music. You notice how Sandman Sims stopped the band from playing, whereas to somebody like Chuck Green music is integral. Duke Ellington had Chuck, so that says a lot. When Chuck came out of that institution, he used to dance with knickers. You asked him why he danced with knickers, and he said so people could see his feet. He wanted people to see his feet. He had enormous feet. As for Jimmy Slyde, it’s all about dancing with the music, to the music. When Sandman Sims is doing a sand dance, he always cuts off the music. It starts when he comes out to introduce him, he cuts it off, and then it ends to get him out. With Bunny, it’s integral to his dance. Everybody has a different approach. DT: What about Steve Condos? GN: Steve Condos considers himself a musical instrument. He says Louis Armstrong is his inspiration though Louis Armstrong didn’t play the drums. He is music. He hears himself, and it’s musical. So everybody was different in their relationship to music, but no matter what, music is an integral part. Whether people use music or not, it’s all musical. They’re just making music with their feet. Remember, tap didn’t come up with music. It came up on the streets in its origin. There wasn’t any musical accompaniment. When Chuck was a little kid, he would dance on the street, gluing bottle caps to his bare feet with tar in order to create the tap. There wasn’t any music that went along with it, so the notion of having actual musicians wasn’t always possible. Peg Leg Bates would dance to music. When big bands had a tap dancer, it was out of a certain respect. DT: You also recorded oral histories with John Bubbles and Chuck Green. Can you talk about those? GN: I did a twelve-hour interview with Chuck and a twelve-hour interview with John Bubbles. Chuck’s interview didn’t make any sense whatsoever for twelve hours—he would just go off and not make sense. I just didn’t get him on a good day. Bubbles talked about a lot of different things. DT: Do you think that part of the reverence for Chuck Green was his connection to John Bubbles? I believe that in tap there’s a lot of respect for the lineage of the teacher. GN: Absolutely, and still to this day. I just showed my film About Tap at the American Tap Dance Foundation, and the place was packed. The legacy is extremely important in tap. It’s unusual the extent to which it’s part of it. In No Maps on My Taps, Sandman talks really beautifully about lineage. He talks about who John Bubbles was and how Chuck learned from John Bubbles. Bunny Briggs talks about how Bill Robinson wanted him as his protégé but his mother wouldn’t let him go. Had Bunny had that as part of his resume, it could have put him in a different class. That was a very big deal being the kid act that followed John Bubbles. Bubbles was extremely famous. He was the original Sportin’ Life in Porgy and Bess. He was a very, very famous tap dancer. He was also the first one to be a hoofer. He used his heel as much as his toe. Bill Robinson would dance more with the toe in a lot of steps. He didn’t use his heel as much. John Bubbles came along and was a real hoofer. Chuck learned a lot from John Bubbles; in the film, you can hear in the phone conversation between the two how much respect Chuck has for him. He calls him Mr. Bubbles. Chuck becomes a child. DT: Would you make another tap film? GN: I do wish that somebody would take the tapes I’ve recently found and do something with them, because I think they’re invaluable. I have hundreds of photographs of these dancers, and I wish there was a place for them. DT: Do you have dance footage? GN: I do, but you have to remember that it was shot on film, so the sound is a separate element. To put anything together is very complicated and expensive, because it’s not like video tied together. All that stuff is housed at the Schomburg library, and all the negatives are housed at the National Academy of Television Arts and Sciences. When I gave it to them the intention was that they were going to put that stuff together, but they never did. DT: Who knows…maybe someone out there will read this interview and give you money to make another film. GN: I’d do it in a heartbeat. Tagged Brenda Bufalino, Bunny Briggs, Buster Brown, Chuck Green, George Nierenberg, Gregory Hines, Honi Coles, Jimmy Slyde, John Bubbles, Lionel Hampton, Lon Chaney, Sandman Sims, Savion Glover, Steve Condos, tap dance, Tony Waag. Bookmark the permalink.